One of the best places in Canada for Whale Watching is in BC or British Columbia. Vancouver Island is the ultimate destination in BC with several whale watching operators departing from Victoria, Campbell River, Sayward, Telegraph Cove, and Port McNeill. Victoria is situated at the south end of Vancouver Island and is where the Southern Resident whales congregate during the summer months, while the Northern Resident Orcas spend the majority of their time from Campbell River north. Fishing in the Pacific waters off the coast of BC is also a very popular activity and many people end up with the best of both worlds. While enjoying some of the best fishing Canada has to offer they also often end up combining this with whale watching. Check out this story about Whale Watching in BC. 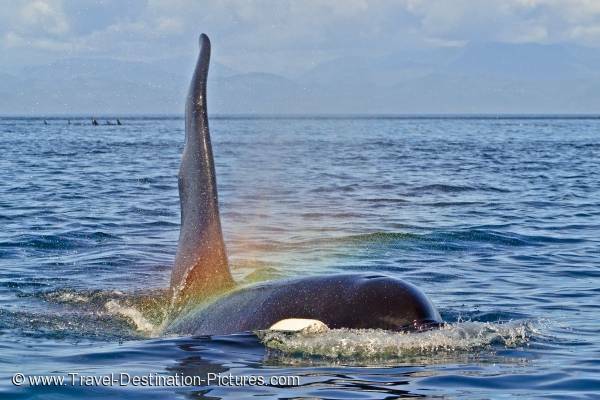 Picture of a large male Orca and rainbow seen during a whale watching trip in BC, Canada.